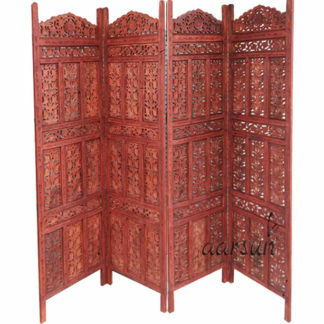 Aarsun Woods bring you this Handmade Folding Partition Screen / Room Divider made from premium quality Mango Wood with beautiful floral and leaf carvings that gives an elegant and traditional look to your living room. The unit consists of 3 panels and each panel comes in a standard size of Height approx. 72 inches (6 feet) and 20 inches wide. This is a traditionally styled louvered Wooden partition screen, with open wood slats allowing light and air to pass through. A solid, inexpensive, attractive room divider; this Classic Indian Screen is hard to beat for quality and price. Great for defining space, temporarily hiding a an unsightly area, or blocking light from a window or door. The Wooden Partition Screen is a 3 panel screen It is fold-able and can be stored in any corner when not required The screen provides privacy The three panel screen provides you with privacy without much effort. It is foldable and can be placed anywhere. Made of premium quality wood this screen is sturdily built for durability and can be folded and stored in any corner when not in use. You can segregate your dining area from the living space or enclose your work area with this Partition screen to enable you to work without being disturbed. If you want a different material design in Wooden Room Dividers / Partition Screen, have a look at Traditional Wooden Room Dividers ,also in case you require fine carving in natural Finish, go for Handmade Wooden Partition Screen. its good for price, packed nicely and sent..